NUDURA is the new generation of ICF (Insulated Concrete Form) technology that is readily available through a value-added network of local authorized NUDURA distributors. NUDURA's double insulation protection is a high-performance stay-in-place expanded polystyrene building form made for erecting concrete walls. The forms have accurate interlocking appendages for easy and quick assembly, and are structurally strong to withstand the weight and fluid pressure of the concrete poured inside. The most important benefit of NUDURA is the amount of labour it can save you. NUDURA technology has a unique combination of time and money saving design features that makes NUDURA fast and easy to build with. “With NUDURA I spend up to 50% less on labor than I did with other ICF systems that I have used." NUDURA builders keep their own crews busy and can avoid needless delays waiting for sub-contractors by building their own foundations. "Two of the reasons I build with NUDURA is to get more control over the quality of my basements and to capture the margins that I used to sub-contract out." Conventional construction can be prone to maintenance problems such as drywall pops and basement leaks. Building with NUDURA can solve these problems and it lets you build stronger, more durable and more energy efficient buildings for your customers. "NUDURA has virtually eliminated the drywall callbacks I frequently used to receive when I built wood-framed homes." The use of NUDURA singles you out as an adopter of innovative technology and a builder of integrity and value. Many clients are now looking at value-added alternatives to conventional construction. Builders and their customers who have used NUDURA speak in glowing terms of it's strength, durability and energy-efficiency. "Building with NUDURA is a point of difference for me. It sets me apart from traditional builders, and gets me more business." At NUDURA, customer support goes far beyond merely answering your telephone queries. Our knowledgeable and helpful staff will put you in touch with your local authorized NUDURA distributor who can provide you with technical guidance and market support. "My NUDURA distributor provides tremendous support. Over the years I've received numerous leads and many jobs from my distributor." Comprehensive training is a crucial component of any new technology. In this respect, NUDURA is committed to providing product training to its builder-clients who want to adopt this innovative technology. Training encompasses proper NUDURA installation and estimating practices as well as concrete placement techniques and connection details. "My first NUDURA job was an 1800sq.ft basement. We started on a Monday with just 4 guys and were finished pouring concrete by Wednesday afternoon. Now that's fast!" You can bet on it- Jamesway Construction group did! 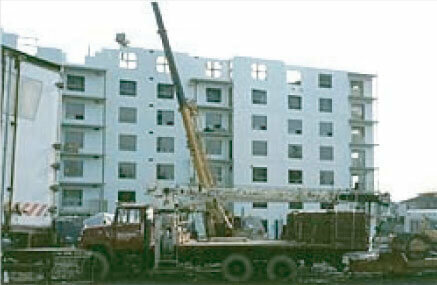 Jamesway Construction Group started laying NUDURA block in early January and by the end of March had completed the 8 stories of this apartment complex. President Al Way and Project Manager Daryl Bender quickly learned how to build with ICF and the benefits of using the product in the middle of winter. This project is on Auburn St. in Waterloo. The following are a number of tips put together to help with the installation of the AIM block as well as general tips that some people have maybe forgotten since their training. Wall tilting before pour. Always ensure that the wall is turned in towards the braces before pouring concrete. This will ensure ability to straighten the wall without having to "pull the wall" in. Rebar placement. After the first row of rebar is placed have someone cut identical rebar lengths and lay them in front of the wall. You will find that the rebar pattern like the block will repeat itself. This saves a lot of time when the rebar is handy. Make your window bucks up ahead of time so that when you are building you just set them in place. Level after 2 courses. The best time to level the walls is after the 2nd course has been laid. If you are shimming the wall up then place the shim under the plastic web so there will be no compression. If the weather is right you can foam under the wall after it is level to tighten things up. Nudura is the new-generation Integrated Building Technology that is vastly superior to traditional stick framing methods. Building technology has seen rapid advances in recent times, with builders and homeowners looking for newer, more efficient ways to build homes that are stronger, more comfortable and energy-efficient, while allowing for flexibility of design and lower future maintenance costs. With Nudura, you can save time and money and get a stronger, more comfortable and more energy-efficient home. Nudura is a highly insulated concrete wall, with no air spaces or studs, that vastly reduces air filtration. When combined with an air exchange system, Nudura technology helps even out the effect of external temperature swings and provides superior energy-efficiency as compared to wood-framed construction. Nudura walls are built with steel reinforced concrete and fire retardant-treated expanded polystyrene foam. Compared to wood-framed walls, Nudura walls are far more likely to remain standing in case of fire, and are far more resistant to the spread of fire. Nudura’s accurately interlocking, lightweight forms make it very adaptable to a variety of innovative and efficient designs. Nudura’s concrete core allows for the easy installation of doors and windows without compromising the structure of your home while curved, sloped and extra tall walls are easily built with Nudura technology. Outside cold can easily travel through a typical wood-framed wall (thermal bridging) to create uncomfortable cold spots inside your home. Nudura walls offer superior performance when it comes to thermal bridging and air infiltration, resulting in even temperatures throughout your home. Nudura’s double foam insulated concrete core acts as an effective sound barrier, dampening sound vibrations and ensuring a serene and comfortable ambience within the home.